It is actually quite easy to boot Windows virtualized using KVM. But to properly use the UEFI bootloader, suitable QEMU arguments are required. Here is a lightly commented QEMU command I use to boot virtual Windows 10 I have on a separate partition. For now I use sudo, because QEMU needs to access raw partitions from /dev/sdb. The other, better way would be assigning a group to /dev/sdb, setting up proper group permissions and adding me to that group. -mem-path /dev/hugepages is better described in Arch wiki. -display sdl -vga qxl Use SDL for rendering and window management in the host and QXL GPU device in the guest (there are QXL drivers for Windows). -drive file=/usr/share/ovmf/x64/OVMF_CODE.fd,if=pflash,format=raw,unit=0,readonly=on This is a very important part. It loads OVMF UEFI firmware read-only as the first Flash device. This firmware implements a UEFI bios and allows running UEFI Shell or booting .efi bootloader for Windows (bootmgfw.efi). This OVMF can be downloaded directly from the OVMF project repo or if you are using Arch Linux, just install ovmf package. -drive file=$HOME/.config/qemu-windows.nvram,if=pflash,format=raw,unit=1 this loads a read-write NVRam flash image as the second virtual flash chip. OVMF firmware uses this to store UEFI variables, .efi boot order, etc. The default image can be copied from the OVMF setup (at /usr/share/ovmf/x64/OVMF_VARS.fd in ovmf Arch linux package). It must be a writable copy. -drive file=/dev/sdb,index=0,media=disk,driver=raw Attaches my raw sdb block device to the virtual machine. That is used as a HDD for the guest, it has Windows pre-installed there together with EFI partition. -cdrom /opt/UefiShell.iso UEFI shell iso as a CDROM. Before OVMF nvram is properly configured to boot Windows by default, this will result in booting into the EFI shell which allows to run .efi executables manually. Windows can be run by just navigating into the EFI partition and running the Windows efi loader – blkX:\EFI\Microsoft\Boot\bootmgfw.efi. I don’t know how to force Windows to write UEFI boot order. There doesn’t seem to be a tool like efibootmgr on Windows. :D Windows would set the UEFI boot order up randomly during some Windows Updates (mostly when you don’t want it to touch your EFI setup). It eventually set the EFI config up for me itself quite quickly. But if it fails, you can try pressing ESC during TianoCore EFI boot to get to boot menu. Or you can always boot Linux using the -cdrom command and use efibootmgr to force the OVMF to boot the Windows loader entry for this virtual machine by default. Usage of the efibootmgr command is out of scope of this article and can be found in many online resources elsewhere. Have fun with virtualized Windows and remember – Windows is good for games only and for stuff like government PDFs which use proprietary Adobe XFA forms and are therefore supported in official Adobe Reader which has the best support in this lousy platform only. Windows definitely shouldn’t be used on servers or anything serious! By default it is very limited (maximum number or RAM, maximum number of CPU cores, maximum number of listening socket connections, etc) until you pay huge amounts of money to Microsoft. Wise people use Linux and lazy people who don’t care about privacy or freedom use Mac OS X.
I’m attempting to run this with debian testing (at the moment deb10), but unfortunately, the ovmf package in the deb repos don’t have /usr/share/ovmf/x64/OVMF_CODE.fd. Also, by OVMF_CODE.fd, do you mean copy it over to .config and renaming it qemu-windows.nvram? Other than that, I’m impressed at how you can virtualize a physical install of windows when virtual box has trouble doing it. So just update the path. In my case qemu-windows.nvram is a “user” copy of OVMF_VARS.fd. 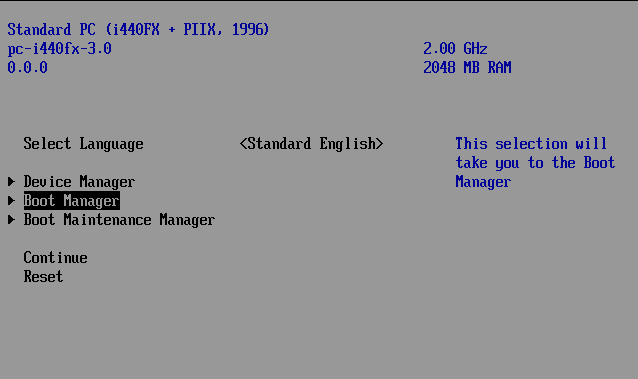 It is mapped by QEMU as a second persistent flash (first being the actual UEFI bios binary which won’t change). This second flash (represented also as a file here) stores the bios settings – mainly boot order (the EFI boot order manages the OS like Windows or utility efibootmgr on Linux and BIOS stores it in this config flash). The original OVMF_VARS.fd contains the ‘default’ settings. Also from the TianoCore project https://sourceforge.net/projects/efi-shell/files/Releases/Official%20Releases/ (linked at https://github.com/tianocore/tianocore.github.io/wiki/Efi-shell). 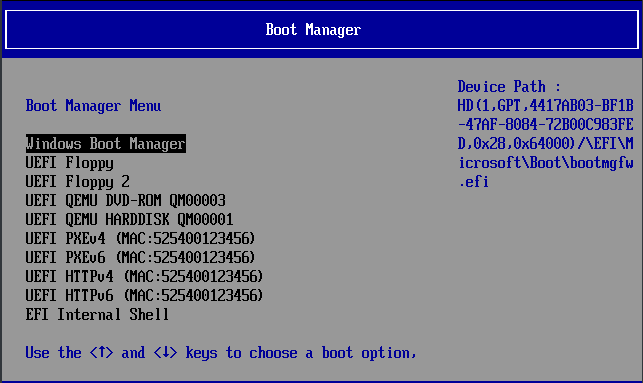 You don’t need it to just boot an EFI bootloader/OS but it is helpful for finding problems, checking partitions or running EFI service executables. Thank you for these instructions. My Linux install is on the same disk as my Windows install. Is there a way to boot Windows virtually when Linux and Windows are on the same physical device? Hey. Definitely. Partitions are on different parts of the physical drive. And this is exactly what I am doing here. I mounted /dev/sdb with index 0 (which is equivalent to /dev/sdb1 where my EFI partition is and this /dev/sdb drive is where I have both OS installed. Note that QEMU counts from 0, Linux creates /dev/sdbX starting 1). The EFI partition (/dev/sdb1 in my case) is where the windows bootloader is (/EFI/Microsoft/Boot/bootmgfw.efi). EFI implementation (or EFI console) can then run this bootloader which then loads registry-like /EFI/Microsoft/Boot/BCD file where the partition UUID of the Windows installation is. That Windows bootloader would then load that partition and continue normal windows booting. So you will use EFI partition initially, run Windows bootloader on it (you can use EFI console mounted as cdrom at the beginning or use boot options of the TianoCore EFI firmware – hit ESC during boot), which then finds and loads the the big windows partition, mounts it and boots from it. Thank you very much for these instructions. I was able to boot up my windows partition. However I only get a 800×600 resolution. I suspect it must be something to do with the fact that I don’t have virtio drivers installed in my windows guest. I am not clear how to go about doing this and more specifically what drivers to install from the fedora repository. Could you please give some additional details on virtio driver installation in the windows guest? You can extract them from Fedora distribution. Fedora ships these drivers signed so they will install without any hacks. I don’t remember exact place but I think I extracted them from rpm – here is a list of fedora stable rpms https://fedorapeople.org/groups/virt/virtio-win/repo/stable/ . Ubuntu also ships the drivers but I don’t know if they are signed. Their debs are here https://launchpad.net/kvm-guest-drivers-windows/+download. Thanks for this. Saved me a ton of time. Used it to boot a copy of the Win10-Edge MS developer ova after converting it to qemu. If you do have to do any boot diagnostics, then the refind cdrom iso https://sourceforge.net/projects/refind/ can be used as a ready replacement in place of the EFI Shell iso. any update on resolution ? Install virtio and QSL drivers from ISO/vfd/rpm from Fedora project https://docs.fedoraproject.org/en-US/quick-docs/creating-windows-virtual-machines-using-virtio-drivers/index.html (iso at the bottom of the page). Those drivers are libre and open-source (https://github.com/virtio-win/kvm-guest-drivers-windows) but Windows requires digitally signed drivers and signing it cost money which Fedora paid. Alternatively you can compile those drivers from the source code and disable driver signature verification in the Windows guest.